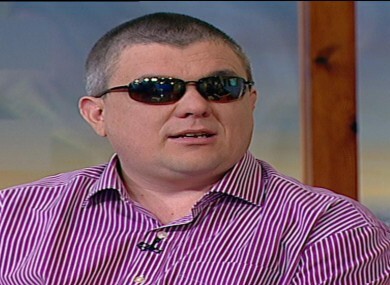 Joe McPhilips has told the story of how he went blind, in the hope of reminding people of the importance of correctly managing their diabetes. A MAN WHO went blind after developing Diabetic Retinopathy has spoken today about the importance of managing diabetes correctly. 41-year-old Joe McPhilips was diagnosed with diabetes at the age of fourteen but was unaware that his condition could affect his sight in such a profound way. Speaking on Ireland AM today, he described how his life changed, in an instant. I was working. I went to work that morning, as I had done for years. I went down to take my 10 o’clock tea break, I had a flask in this hand, a sandwich in the other, and it was great, total vision, and my right eye haemorrhaged, just a complete bang. I said to myself ‘that’s not good’. A senior optometrist told him that in 6-8 weeks, he would also be blind in his other eye. At first, McPhilips said he was in “complete denial”. Every day I got up and could still see the press, runners and shoes, work clothes or whatever. Finally, I’ll never forget, I went to go to the bathroom, went to look at myself in the mirror and I couldn’t see my face. I could see what was around me, peripheral vision was still there but the centre vision was gone and. I said ‘oh I’m in trouble here’. The father of two also spoke about the pain he feels at not being able to see his children. “My daughter Annabelle was four. She’ll always be four in my head,” he said. “She’s heading for eleven now so she won’t be happy with me saying she’s four. About one person with diabetes goes blind every week. Also appearing on the programme, eye specialist Dr Susan Kelly spoke about a new free screening available to patients with diabetes aged 12 and over. She also said campaigns like ‘Eye am what I eat‘ are vital in raising awareness for diabetes and those who are living with it. Email “'I went to look at myself in the mirror and I couldn’t see my face'”. Feedback on “'I went to look at myself in the mirror and I couldn’t see my face'”.